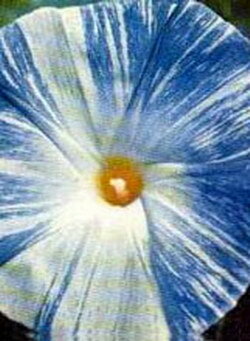 These untreated Flying Saucer variety of Morning Glory seeds provide fast growing vines to 15 ft. with huge 5" blooms of pure white brushed with lavender-lilac to blue in a pinwheel pattern. Lush, tropical-like foliage provide a nice variety to the usual "Heavenly Blues" that most morning glory fans are familiar with. Generations of Aztecs and natives in Mexico (Oaxaca region) reportedly believe that a deity lives within the seeds and they may have held Morning Glory quite sacred as a result. Today, the "Flying Saucers" variety is the rarest Morning Glory variety, and they are grown as a climbing vine with beautiful flowers. Seeds are organically grown and harvested. A great addition to any Shaman's Garden; these seeds can even be planted in cold climates as they will overwinter and grow a entirely new crop year after year.